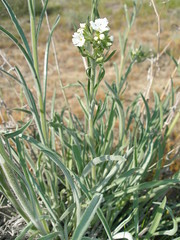 Sagebrush stickseed flowers are white and showy but tiny, less than half an inch wide, and the simple petals look just like a child would draw a basic flower. The leaves are coarse, hairy, and rather short, two to seven inches long, with a cluster at the base and smaller leaves going up the stems. The stems branch at the base into multiple flowering branches, growing eight to twenty-eight inches tall. The name stickseed describes the seeds of this plant which are covered by minute, branched barbs or prickles that facilitate the seed’s dispersal by sticking to fur and clothing.